New: in response to frequent requests, Online Personal Retreats are now available! Whether you are looking at a specific issue or exploring your life's purpose, a personal retreat allows you the time and space for personal exploration, clarity and relaxation, personal growth, deepening insights and replenishment. A retreat gives you the opportunity to withdraw and turn inward, away from the world of ordinary everyday demands, pressures and responsibilities. On retreat you make time for issues that are calling to you from your inner world, to relax, recuperate and refresh yourself spiritually, physically, energetically, mentally and emotionally. You may want to give time to any one of a wide range of issues: health, relationships, career, personal development, a sense of meaninglessness, lack of purpose, challenges of aging, coping with emotions, anxiety, depression, crisis or spiritual enquiry. Your retreat can be self-directed, or themed with guidance, skilful reflection and encouragement from Richard in daily therapy meetings. Retreats are available to individuals and couples. You can come on The Standard Retreat, or if you would like more specific focus and guidance, you can come on one of The Themed Retreats: The Inner Journey, The Path of Love, or Spiritual Life and Sacred Practice. Also there is The Practitioner’s Retreat, which is for counselors, therapists, alternative/complementary healers, social workers, doctors and health professionals. Finally, you may come for The Simple Retreat and be entirely self-directed, get away from it all and have peace and quiet, without interference. 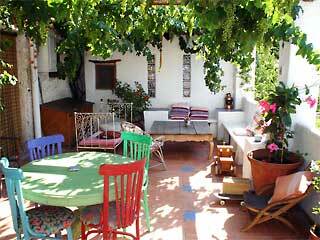 And if you cannot come to Andalucia, you can now choose an Online Personal Retreat. What Kind of Personal Retreat Do I Want? The standard retreat is where you bring the issues you wish to address and take advantage of the ambience and gentle routine of the retreat environment to bring attention and concentration to your inner work in a powerful and profound process of personal growth and inner fulfillment. Your days are punctuated with therapy sessions with Richard in the morning and the evening. In between you relax in nature and comfort, do your inner work and allow the healing ambience to stimulate you. Choose from three themed retreats in which Richard helps and guides you through the three perennial themes of life—your relationship to yourself, to others and to spirituality. The Inner Journey enables you to take the next step in personal exploration, to appraise your inner work and progress so far, to identify your present life lessons and deepen in the work of change and transformation. The Path of Love focuses on, first, your relationship with yourself, your heart-centeredness, your personal authenticity, and second, how you relate to others through your character defense, exactly how relationships work in your life and, how they fail and succeed. Spiritual Life and Sacred Practice focuses on a profoundly spiritual approach to the issues of living a sacred life in the modern era. Work, livelihood, family, friends, leisure and creativity, home life, relationships and money, ego-processes, religious beliefs and ritual, dealing with time and scheduling life are all highly relevant issues for strengthening and deepening in spiritual life. Spiritually we look further at issues such as compassion, the life of service, devotion and your spiritual aspirations. A time for caring for the carer: relax, refresh and re-charge your batteries if you are a practitioner and also reflect on your practice and specific aspects of your work with Richard in individual supervision sessions. For information on Richard’s approach to practitioner’s supervision see	supervision for practitioners. Where you direct your self, without sessions or disturbance, in natural surroundings free to walk, hike and explore, be creative, sleep and relax in the peace of the retreat environment. If you are unable to come to Andalucia for your retreat experience and are able to set aside six or seven days to attend to your personal and spiritual growth and development then consider booking an online retreat. 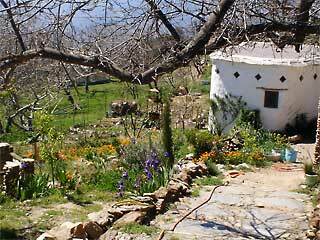 Your retreat accommodation is in a lovingly converted Alpujarran goat shed (affectionately called “The Ruin”), which has been transformed into a fully self-contained casita (or small cottage). 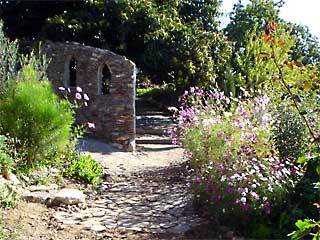 The building is of 200-year old traditional Alpujarran stone construction. It has been beautifully restored as an eco-build, using all sustainable materials. The renovations include restoration of the natural stone and cob structure and rendering the inner walls with lime and marble dust and staining them with natural earth pigments. The limecrete floor is finished with Carnauba wax. 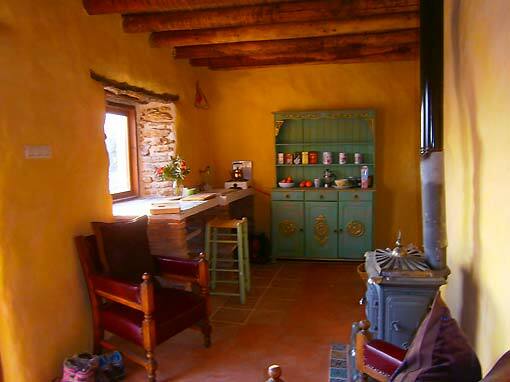 The natural hemp roof is supported by a traditional caña ceiling and lindseeded chestnut wooden beams. The Ruin comprises a small double bedroom with a comfortable bed with cotton linen and duck-down duvet, shower and washroom, and sitting room/kitchenette with a wood-burner, Currently work is in progress on a private patio and garden exclusively for retreat use. You also have use of the Mountain Yurt for some or all of the day (depending on workshops and practice schedule), which provides a comfortable space for physical exercises, yoga and meditation. In the summer months you may cool off in our small non-chlorinated pool. Your therapy sessions take place in the Mountain Yurt, Richard’s therapy space in which he sees individuals and couples, and leads workshops. 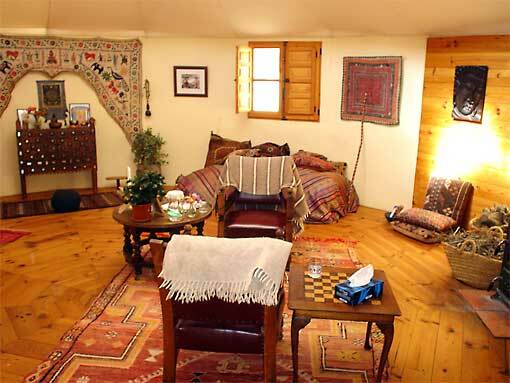 The yurt is situated on a terrace of walnut trees and is made of natural wood and canvas. The circular structure gives a feeling of wholeness and harmony which lends itself to restfulness and focus. Warm light is diffused from the crown during the day, you can see the Mediterranean from the south-facing window and after dark you can see the stars in the night sky. Each day, usually in the morning and the evening, you have two one-hour therapy sessions with Richard. Extra therapy sessions are available during your retreat, if you feel the need for more individual time. After making your booking, you write down your goals for the retreat and send this information to Richard for a confidential assessment. Richard sends it back to you with comments. Work with these comments to refine your goals and bring them with you to the retreat. 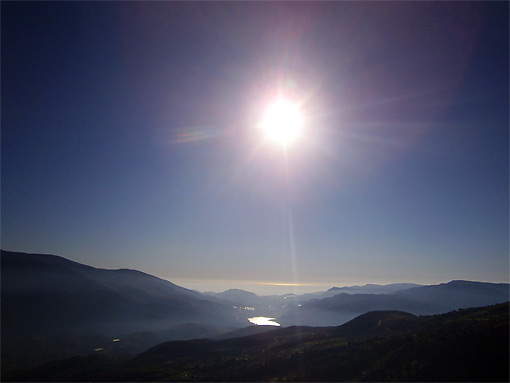 Your retreat schedule may include inner work in the form of writing, drawing, dialoging, holistic exercises, meditations, breath exercises, awareness exercises, walking and relaxation, punctuated by meal times, periods of relaxation, walking and time for contemplation and communing with nature. You might find it helpful to look at my article, pointers on inner work practice. A one-week retreat consists of an arrival day and a leaving day with five days of intense inner work in between. This allows you to fully arrive here and to ease back into the world. You may arrive from 13.00 on your arrival day and we ask that you leave by 12.00 on your leaving day. Two-week or longer retreats can be arranged on a pro rata basis. 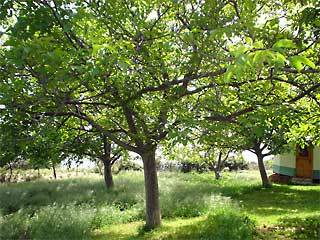 Cortijo Llano de Manzano is a center for personal growth and spiritual development with a program of courses and workshops, and the locus of Richard’s private practice for individuals and couples. It is also a family home and a small-holding. 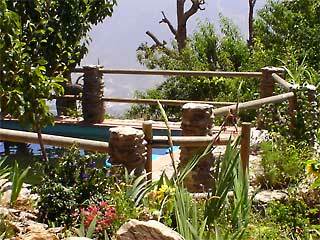 The cortijo and outbuildings are set in a beautiful and tranquil three acres of walnut, peach and cherry trees, rocky outcrops and stone-walled terraces in the Alpujarras, the foothills of the Sierra Nevada mountains. 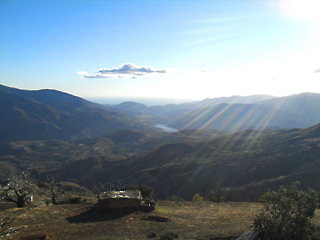 Set at 1200 m altitude, the air is the cleanest in Europe, the views are breathtaking and on a clear day you can see the Atlas Mountains of North Africa over the Mediterranean Sea. 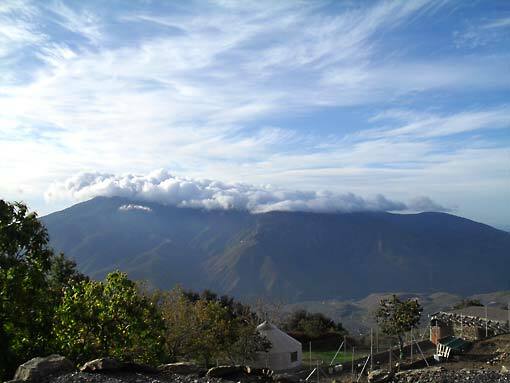 For more information on our location see Cortijo Llano de Manzano. We lead an eco-friendly, low impact lifestyle, managing our own water supply and using compost toilets and solar energy. There are no services provided here: everything is brought in and maintained. Our solar electricity is supported by a back-up generator. Our water for irrigation, washing and kitchen use comes from the fresh snow melt on the high Sierra. At present drinking water is brought up from the local fuente (spring), but we plan to sink a bore hole to give us our own independent water supply. With all this in mind, please do not bring high-powered electrical appliances, like hairdryers or electric hair curling tongs, because our system will not be able to support them. Also note that a wifi connection is not available to you here at the center, although if you have a pressing need to use the internet during your retreat, you can go online at internet facilities in Canar or Orgiva (see the location for more information). The climate here is very agreeable, but August and July are usually very hot and January and February are the coldest months. Winter can be extremely cold and unpredictable. Although it can easily change, so we recommend looking at the weather forecast before you come. If you are coming from abroad, the nearest airports are Málaga and Granada and frequent and cheap flights are available to both. You will need to hire a car or engage one of the unofficial taxi services that operate in this area to pick you up and return you to the airport. We can send you a list of telephone numbers on request. Please see more details on our travel information page. The Standard Retreat, The Themed Retreat, The Practitioner’s Retreat 1716 euros, fully-inclusive of retreat accommodation in “The Ruin” with full catering* and therapy sessions with Richard (10 hours). 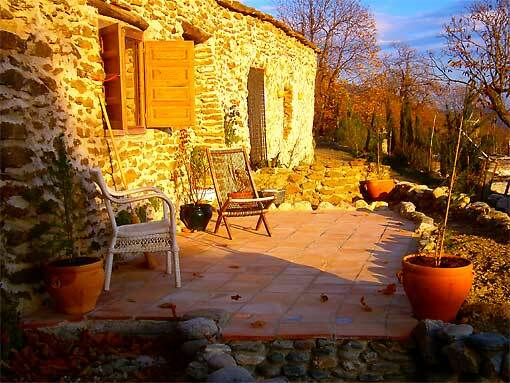 390 euros, retreat accommodation in “The Ruin,” self-catering. The Standard Retreat, The Themed Retreat, The Practitioner’s Retreat 2575 euros, fully-inclusive of retreat accommodation in “The Ruin” with full catering* and couples therapy sessions with Richard (10 hours). 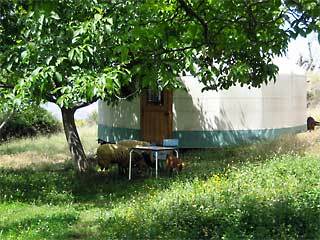 580 euros, retreat accommodation in “The Ruin,” self-catering. *Full catering includes breakfast (bread/toast, butter and spreads, homemade organic muesli, milk, honey, tea, coffee, herb teas), lunch (home-made bread, cheeses, seasonal salad) and evening meal. We do not accommodate children or animals on personal retreats. Bursary grants are sometimes available through Richard Harvey/Therapy and Spirituality, so that people who sincerely wish to, and would otherwise not be able to afford to, can come here on retreat. If you would to apply for financial assistance for a personal retreat please send your reasons to us using our retreat request form below. Preference is given to women who are unable to support themselves due to societal restraints, being single-parent mothers, victims of domestic violence, or who are simply unable to afford therapy when they are in need and/or particularly motivated toward self-enquiry. If you would like to make a donation or to know more about supporting the work of Richard Harvey/Therapy & Spirituality see offering support. Apply for your retreat, using the request form below, giving us your preferred dates and any alternative dates. We will confirm your dates by email or discuss alternative dates with you if we cannot meet your preferred dates. Pay a 50% deposit to secure your retreat, using our secure Paypal payment facility (if you don't have a credit card or a Paypal account, contact us for bank details to make a transfer or for other arrangements). Note that all bookings are made subject to the payment terms below. Deposit: A 50% deposit is payable to secure your booking and is non-refundable if you cancel for any reason. The Balance: must be paid by the start of your retreat. You can pay it in cash on arrival (in euros) or online before arriving, using our secure Paypal payment facility (if you don't have a credit card or Paypal account, contact us for bank details to make a transfer or for other arrangements). You will receive an automatic copy of the request you send, at the email address you enter below. Your email address will not be given to any third parties (please see our privacy statement for more information). Many people have asked me if they could have a Personal Retreat online. At last I have found a way to make it possible—you can now experience a Personal Retreat online! If you are unable, for whatever reason, to come to Andalucia for your retreat experience and if you are able to set aside six or seven days to attend to your personal and spiritual growth and development then consider booking an online retreat. or you are a practitioner (a therapist, counselor, or healing professional) who needs some time for yourself. 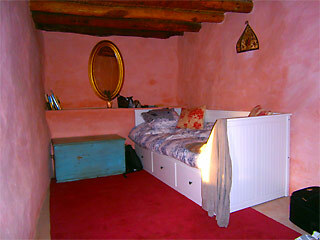 The full cost of the Online Personal Retreat is 1170 euros. Start by reading the information on the Retreats in this page. Adapt this information to participation in the retreat at home. Go to How to Book and then fill out the Request Form. Follow the instructions and we should be able to agree on your chosen dates fairly quickly. Pay your deposit—see item 3. in How to Book. I will send you a Booking Conformation with all the information you need for your Personal Retreat. Within 10 days of the starting date of the retreat you email me a page-long statement of your aims for the retreat. I will review your aims and send my comments back to you with suggestions, reflections, and ideas for you to work with up to the start of your retreat. Pay the balance of your retreat. On the first day at an agreed time, we will begin your retreat at a frequency of two hour-long sessions a day for five days. We will discuss tasks, practices, and inner work for you to do in between sessions. The days before and after the retreat should be as quiet and contemplative as possible to allow the most beneficial results for the retreat. A beautiful week in a beautiful place. Thank you Richard for our work this week and all that has meant… J.K.